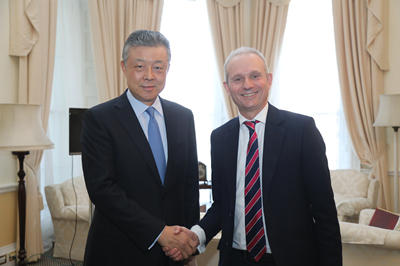 On March 26, Ambassador Liu Xiaoming met with David Lidington, UK Minister for the Cabinet Office, and exchanged views with him on the 10th China-UK Leadership Forum. Minister Ma Hui of the Chinese Embassy was present. Ambassador Liu extended his welcome to Minister Lidington ahead of the latter’s visit to China in mid-April as head of the UK delegation to the 10th China-UK Leadership Forum. He said that, for many years, the Forum has been playing a constructive role in enhancing the understanding and cooperation between the Communist Party of China and major British political parties and enriching China-UK relations. Following the 19th National Congress of the Communist Party of China, the NPC and CPPCC sessions, and Prime Minister May’s visit to China, and as China marks the 40th anniversary of its reform and opening up, this forum is of special significance. He hoped that the two sides would work together to make the Forum fruitful and contribute to China-UK “Golden Era”. Minister Lidington said that he has participated in the Forum three times and visited China with the delegation of the All Party Parliamentary China Group as well, each of which was rewarding. The Forum has become an effective way to promote mutual understanding, friendship and cooperation between Britain and China. He is looking forward to attending the 10th China-UK Leadership Forum in China and having in-depth exchanges on the cooperation between the political parties of the two countries and other issues of common interest to help consolidate the “Golden Era” of China-UK relations. The two sides also exchanged views on international issues of common concern.